The LMG3410-HB-EVM configures two LMG3410 GaN FETs in a half bridge with all the necessary auxiliary peripheral circuitry. This EVM is designed to work in conjunction with larger systems, such as the LMG34XX-BB-EVM or a custom designed power stage. 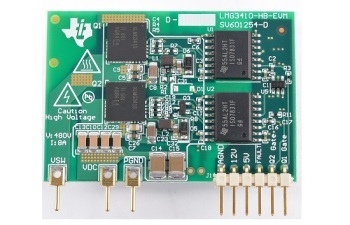 By providing the LMG3410 on a high performance layout with convenient connection points, operation and in circuit measurements can quickly and easily be achieved. No level shifting or isolation is required since all necessary circuitry is included. The auxiliary bias can be generated in two ways, default with isolated power supplies that require only a single 5V input and configurable to operate in bootstrap mode off 12V. Exposed copper pads are provided for heatsink assembly to allow for higher power dissipation.